(Newser) – The Obama administration often argues that promoting green technologies will create new American jobs, but tell that to the 200 guys still working at GE’s last major incandescent light bulb factory in Virginia. 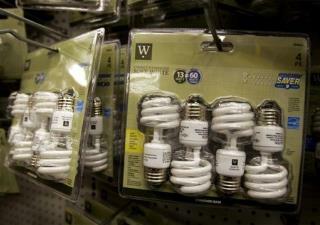 The factory is closing this month, thanks to a 2007 law essentially outlawing the old-fashioned bulbs. The efficient CFLs that will replace them were invented here in the 1970s, but are largely produced in China, the Washington Post reports. Next on Newser: Do We Have the Right to Lie? We need to harass our government to increase tariffs on imports so that a light bulb from China costs the same as a light bulb from USA. Then at least it is a level playing field. If price was the same I would like to think that manufacturing in America would take off again. So 60 Minutes does a show where they bring a girl who works in a factory in India to a Walmart in America. She's shocked by how much what she made is being sold for, especially when compared to what wages she earned while making those goods. The reporter pulls American customers over in the store, detailing the wages the worker earned making those goods. Then he asks the customer if they'd be willing to pay $2 more for the goods in order to cover the cost of paying for "decent wages" for the factory workers. Only 1 or 2 said they would. But I know...it's just far easier to blame this on partisan politics than to confront the fact that we, as a whole, are the problem. Certainly, that $2 still wouldn't be enough to raise the wages to fit into what we call "minimum wage", so if we really want "made in USA" goods, we're gonna have to come to terms with a very different attitude towards our spending. Our country became one that valued consumerism above all else quite a long time ago; your "worth" within this country is gauged by what you can buy. The more you can/will give your hard-earned money to someone else in return for a half-useless piece of crap is the barometer for success here. This isn't really about politics so much as it is about American consumerism. The policies under Obama weren't exactly a surprise , and GM had more than enough time to prepare to transition to a new product for production. Those policies didn't force GM to get the bulbs made in China, it challenged their bottom-line.